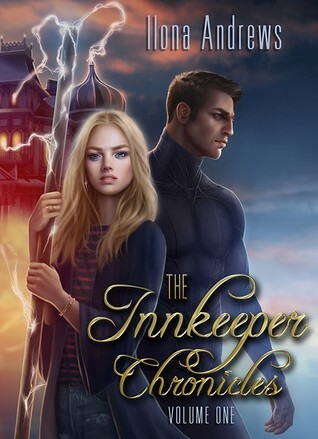 I’ve long been a fan of Ilona Andrew’s Kate Daniel books, but The Innkeeper Chronicles was the first time I’ve checked out some of their other work. This edition is the first three books in the series bound into one volume. For plot specific commentary, I will divide this review into separate parts, so you can read without fear of spoilers. Dina seemingly runs a humble B&B in an ordinary Texas suburb. However, Dina’s B&B has an unusual set of clientele: aliens. Her permanent guest is a former galactic tyrant with a huge bounty on her head, and Dina regularly plays host to such species as genetically modified were-wolves and space vampires. The Innkeeper Chronicles is an eclectic mix of urban fantasy and science fiction. As ever, Ilona Andrews blew me away with sheer inventiveness of the world they created. Clean Sweep, the first book in the collection, introduces us to Dina and her inn. Dina’s parents and their inn disappeared mysteriously, years ago, and all Dina wants is to find them. Now she’s trying to run her own inn, hoping that one day a visitor will be able to tell her where her parents are. But she’s struggling to get her inn off the ground, and matters get even worse when something extraterrestrial starts killing neighbor’s dogs. Innkeepers aren’t supposed to get involved, but Dina can’t stand back and wait for it to escalate. The second book, Sweep in Peace, sees Dina hosting a peace summit between three intergalactic species, who have been warring with each other for years. Sweep in Peace was probably my favorite of the three. I always love books with aliens and alien cultures, so Sweep in Peace scratched that itch for me. Plus, it was mostly without Sean, Dina’s super annoying werewolf love interest. More on Sean and how little I care about him later. One Fell Sweep, the third and so far last book, gives Dina the chance to help save a guest’s species from annihilation, but she would have to deal with the hoards of assassins his presence would bring. Oh, and she received word that her estranged older sister is in dire need of help. I like most of the characters all right, but I never really loved any of them. Dina’s suitably competent, and the magic of the inn definitely has a cool factor. I was starting to feel like the books needed more female characters, so I was glad when Dina’s sister Maude was introduced in One Fell Sweep. But I had zero patience for the romance subplot. Dina is sort of in a love triangle with Sean the alpha werewolf and a space vampire warlord. Wow, I’m rolling my eyes just typing that sentence. Anyway, it’s so clear that Sean is the real interest, but he gets on my nerves so much! He’s one of those alpha male love interests who I can’t help but hate. This series in general could feel overwhelmingly heterosexual at times. I guess I’m not really the intended audience. While The Innkeeper Chronicles could be a bit frustrating or cheesy at times, I still had fun reading it. The three books in one volume format made it oh so easy to binge read. I’ll admit that I read this entire collection in roughly forty-eight hours. What can I say? I love urban fantasy and science fiction mash ups! I’m not sure it’s something I’d wholeheartedly recommend, but you might want to check it out if you’re in the mood for fluff. I have an ARC of this collection so I have an idea of how hefty it is – kudos for reading the whole thing in ~48 hours! I’m planning on tackling it sometime soon as well, since I have been interested in this series for a while. I’ll probably take a break between the installments though, but glad to hear this first one was decently enjoyable! Having it as an ebook just let me keep going without really realizing how long it was. Have you read anything else by Ilona Andrew before? I’ve loved the Kate Daniel series for a while now.